Please fee free to make a reservation by clicking the 'Book Now'' green button above to the right. Are you looking for a quiet peaceful alternative vacation experience away from the hotel zone but minutes away from South Maui's best beaches, restaurants, shopping and golf ? Then experience Maui Ocean Palms, which is a half acre luxury vacation property with a beautiful island style home with all of the modern amenities, designed by renowned architect Hans Riecke, breathtaking panoramic ocean and islands views, and a large private swimming pool. This gated access home is air conditioned (new very quiet Mitsubishi 3 zone mini-split system) but you really won't need it! The Mountain, Haleakala, looms behind this beautiful property, and cool breezes descend from the mountain at night. The 2 bedroom / bathroom combinations are at opposite ends of the home for 'quiet time' separation. The ocean/islands view is amazing and overlooks lush tropical vegetation and the Southwest Shoreline - specifically The Four Seasons Resort and Grand Wailea Hotels, and beyond to Molokini and Kahoolawe. The property is lush and tropical with mature flowering vegetation on all sides. At the front of the home there are two enchanting waterfalls as you approach the entry area. The best beaches on Maui are within several minutes drive down the hill. If you enjoy walking... the hillside where this home is located is a secluded neighborhood... all properties are half an acre minimum and spread apart. Area attractions within minutes include Golf, world class Restaurants, the Shops at Wailea, Spas, Luaus, the beach-path, water-sports and the best of Maui sightseeing. Complimentary 5Ghz WIFI in all areas. Beach chairs, umbrella, coolers, beach towels, and kids beach toys are provided. The private guest area is the upper floor, and pool / BBQ deck area as shown. The owners Connie and Dave Lawler welcome guests to Maui Ocean Palms, to enjoy a truly alternative vacation experience away from the crowds. Yet all of the nightlife, and activities are only a few minutes drive away. We purchased this property because of its spectacular panoramic views, cool evenings at 500 ft elevation, the Hawaiian feel of the home ( yet with all of the modern amenities ), the fabulous sunsets, and the all around feeling of well being one acquires from spending time here. 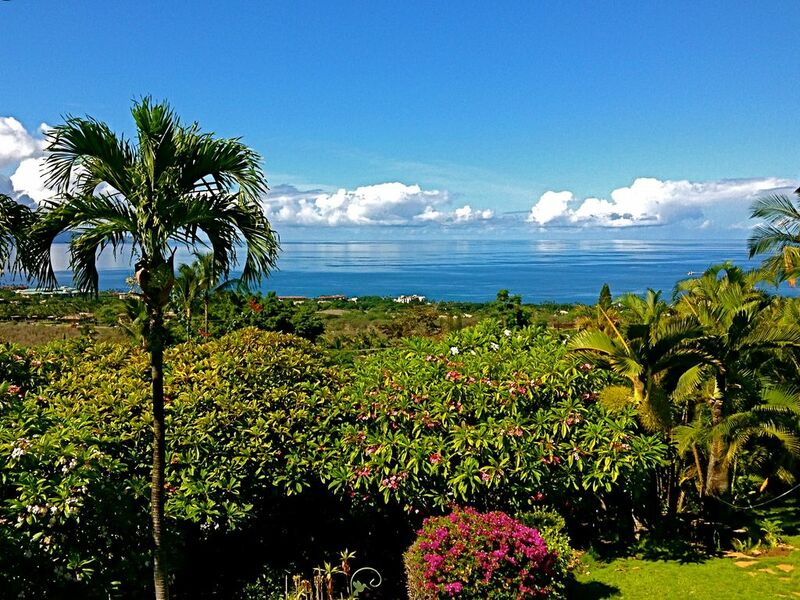 Maui Ocean Palms is a very peaceful and secluded retreat and is truly relaxing. Visitors will hear the trade winds in the palms trees, the trickle of the waterfall ponds, and the experience full benefit of nature at its best. This vacation rental is a very private and secluded large luxurious upper floor of a gated 1/2 acre estate home in a quiet residential neighborhood. We also supply boogie boards, beach towels, beach chairs, cooler and beach umbrella for our guests. Words cannot describe the view from this place. Dave and Connie’s house is immaculate and spacious, the beds were soft, and the kitchen was excellent for all our needs (for both snacks and full meals). The pool area is amazing as well, but it is the lanai (deck) which my family still misses... and hopes to visit again in the future! Not only was the view of the ocean and surrounding islands incredible (pictures don’t do it justice), but the night sky was breathtaking. The location is also perfect for all the surrounding beaches, shopping, and restaurants. Thank you, Connie and Dave, for sharing your wonderful home! This is an amazing property—serene and peaceful, well maintained, and fully equipped. Just perfect! We had a wonderful vacation in this lovely home. The views from the lanai, the living room, the kitchen and the bedrooms are spectacular. The neighborhood is quiet and peaceful—no traffic noise, only the sounds of birds and fountains to wake up to! Everything is quality, from the flooring and furnishings to the towels and dishes. We had everything we needed and only had to bring a few clothes and food! The house is a short driving distance to beautiful beaches and great restaurants, with grocery shopping nearby. The owners, Connie and Dave, have put a lot of love and thought into providing the perfect retreat. The pictures are accurate, but can’t truly depict the special feeling you get when you walk in the front door. We can’t wait to return!!! We stayed in this lovely property for 3 weeks [Dec 21st to Jan 11/19]. Our dealings were with Dave, who was a very gracious and accommodating host. The first thing to mention about this place is that the view is absolutely spectacular! We have stayed many times in many places in Maui, and this is by far, hands down, the most beautiful view we have ever had the pleasure to experience. The sunsets were absolutely amazing. The upper deck is the best spot for viewing the sunsets. The lower property has a good sized pool, with comfortable lounge chairs and a dining area. This is also where the barbeque is located. Our family used the pool almost daily ... it was very clean and well maintained. The unit itself was spotless and very well equipped. We appreciated having some basic spices in the cupboard. The beds were very comfortable. The owners have provided many thoughtful touches, such as a pair of binoculars for whale watching, as well as an assortment of items to take to the beach, such as chairs, umbrellas and boogie boards. The rental unit is located in a beautiful residential area. After previously staying in the 'hotel zone' in Wailea, we really appreciated how quiet and peaceful it was. The property is beautifully landscaped and maintained, and the sound of the birds adds to the tranquil experience. Don't be afraid to ask Dave about recommendations for dining and activities ... he is very knowledgeable and helpful in that regard. This is an amazing property and we will definitely be back someday. Loved it! Amazing view, quiet neighborhood and clean! We really enjoyed our time in Maui and Dave and Connie’s home provided the perfect homebase for our family. The home is beautiful and well appointed. The large Lania offers a terrific view of the ocean and a great place for outside breakfast or sunset dining. Multiple whale sittings and an impressive breach added excitement each day. There is Great Wi-Fi and a large TV for the big game. We will plan to return for our next trip to Maui. In one word, Awesome. The views are incredible. The lanai is huge as is the pool. The pictures don't really do this place justice. We will stay here every time we come back to Maui now. Thank you Dave and Connie! The Zindels. This property is in a quiet residential neighborhood. Please observe quiet time of 9:00pm until 8:00am each day. Check-in time is 3:00pm, check-out time is 10:00am (unless previously arranged ) Cancellations: Full refund if property is able to be re-booked for the full cancellation period. We do recommend trip cancellation insurance.